Nice. You know what would be handy... is having a button to press to put in the empty framework for embedding any image with text that says "Image Description" and one that says "URL of Image". We do a ton of image embedding and most of our users upload them rather than linking to existing content because they can't figure out the markdown to put in. In a nutshell, perhaps something like this? @julian Yes, that would be great! 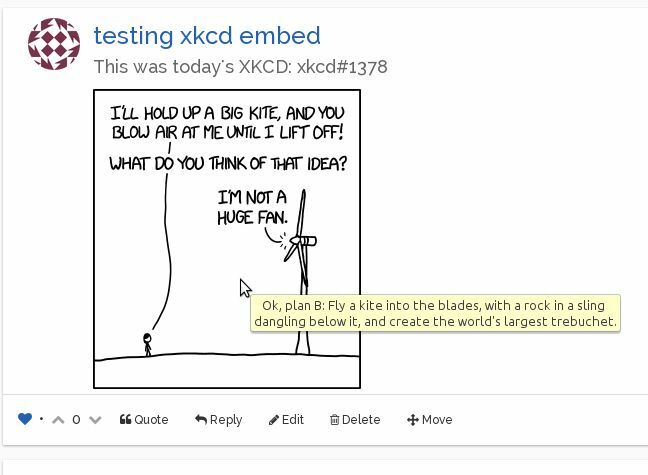 [idea for plugin] oembed: embed all the things! SOLVED my plugins do not update !?! [nodebb-plugin-mentions] Username Mentions have landed!